The Studio is perfect for hosting a variety of experiences: anniversary celebrations, sweet 16 parties, off-site retreats, monumental birthdays, graduations, holiday parties, class reunions, sorority fund raisers, galas, fashion shows and much more. 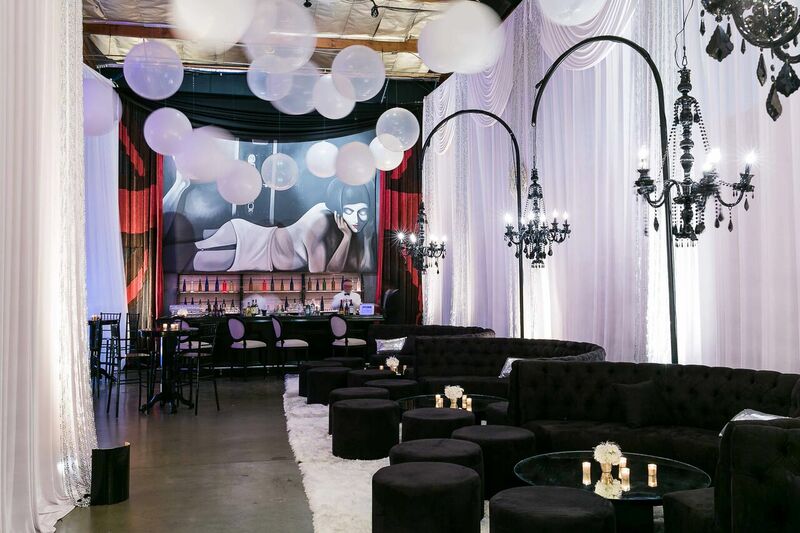 We have everything you need to host an extraordinary event. The studio was created with photographers in mind - best said by a Studio Client. "Any independent film and television producer needs to know about L'Cheriyve. The space has multiple high production value sets from a designer kitchen to a restaurant / bar set to bedrooms to a dungeon. Crew and talent both feel instantly at home. Ali understands production and will make sure that you get what you need to get the shot. A hidden gem!" “L’Cheriyve is a love story between a man and a women. His adoration of her & her desire to give him an experience he will always remember.”Founder, L’Cheriyve..... and with this love story comes many ways to celebrate. Our Brides and Grooms have hosted engagement photo shoots, bachelorette parties, rehearsal dinners and most important, the wedding ceremony and reception. You will have fun being the star of your own photoshoot, showing off your beautiful, sensual, and playful sides. Leave your inhibitions at the door, so that you can truly enjoy this unique adventure at L’Cheriyve. Needless to say the party happened without any hiccups. I highly recommend them for your party....I'm trying to find a reason to have another party so I can do it here again! Thanks L'Cheriyve you ladies are the best!!! I got invited to a birthday/proposal (Hawaiian Themed) event.I am so in love with this venue is beautiful. It's definitely a hidden gem! The interior of the venue is also amazing well designed , very spacious. The gourmet kitchen is so elegant. The make up room is stunning,gave me chills walking in there One of the best venues that I've been to. This place is definitely a hidden treasure. I went on a tour on Saturday to decide whether or not i woild choose this location as a wedding venue. From the outside it doesn't really look all that but from the moment you take that first step you will be amazed at whats behind those doors.. We met with Sade and let me just say this woman was amazing. She answered every question she gave us every detail and by the end of the tour we were booking the location to host my wedding and reception. My fiance was in awe of this place. We are super excited ton continue working with Sade and hosting our event here. Take it from me if you are looking for a place were you can let your imagination flow and make it your own this is the placr to go. Celebrated my 50th bday on May 26th at this magnificent place. My whole experience was so joyful. My party guest was in disbelief when they saw how stunning the inside was. Little to no decor needed. I had the greatest rep. Marlene. She went waaaay beyond to make sure that my event was going perfect from day 1 to the day of. This is truly a hidden Gem in the city of Gardena. I highly recommend this experience. #1 in my book. When I first stepped into this venue 3 years ago, I KNEW my daughter's pre-prom party was going to be here. I booked a year and a half in advance not knowing the exact day, I only knew I had to have it here. The staff is amazing to say the lease. Yvette, Marlyn, and Erin are all a pleasure to work with, providing their expertise just a phone call away. This place is a must. The pictures does L'Cheriyve Studios no justice. Trust me! My Husband and I held our wedding here (ceremony and all) and we couldn't have been happier! It is definitely a "diamond in the rough", the minute I walked in w my husband we knew this was the perfect place for us. Our guests are still talking about how cool the location was months later! Ali was very helpful and responsive, would definitely recommend hosting an event here.